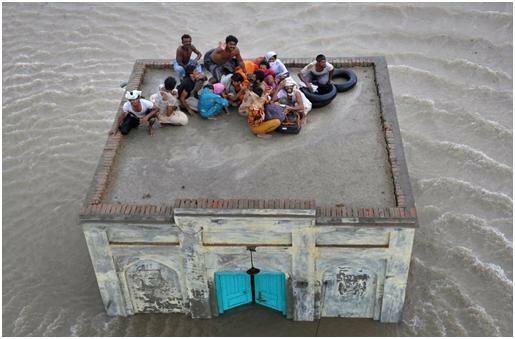 The recent floods in Sindh have triggered a debate in the media about the role of the Left Bank Outfall Drain (LBOD) in exacerbating the disaster in the south-eastern districts of the province. Much has been said and written about how the LBOD, meant for the drainage of excessive irrigation water from Nawabshah, Sanghar and Mirpurkhas districts into the Arabian Sea, has turned out to be a recurring cause of flood disaster since the 1999 cyclone in lower Sindh. The debate focusing on the LBOD issue draws attention towards the much larger issue of `drainage crisis` engineered by international aid through man-made structural interventions in irrigation and drainage in the Indus basin — the only river basin of the country. The portion of land drained by a river and its tributaries is the river basin. It encompasses an area of land where surface water from rain and melting snow converges on a single point called the exit of the basin, and eventually flows into an estuary, a lake, an ocean or a sea. The Indus basin is one of the largest basins in Asia. It extends over four countries including China, India, Afghanistan and Pakistan. Around 56 per cent of the Indus basin lies in Pakistan. The British Raj introduced a modern irrigation system with perennial water supplies through mega structural measures like headworks, weirs and barrages on the rivers. Such interventions in the Indus basin commenced in 1859 with the completion of the Upper Bari Doab Canal (MBDC) from the Madhopur Headworks (now in India) on the Ravi. However, considerable expansion of the irrigation network in the Indus basin took place in the decades following independence. That expansion was possible because of international aid (read loan). With three storage reservoirs, two headworks, 16 barrages, 12 interlink canals, 44 canal systems, more than 64,000km of canals and 90,000 water courses in the Indus basin today, Pakistan has one of the largest contiguous irrigation systems in the world. But from the outset, the intensive irrigation network has unleashed a range of social and environmental problems including marginalisation of the landless and indigenous people, demographic imbalances tilted in favour of powerful political and ethnic groups, the erosion of flora and fauna, and last but not least, land degradation in the form of waterlogging and salinity. The huge irrigation and drainage network developed over one and a half centuries has created an unprecedented drainage crisis in the country. The construction of storage reservoirs, barrages, weirs and other engineering works across and along the Indus rivers has seriously obstructed natural drainage in the Indus basin — both in low-lying ( or ) areas and high lands (). In addition, the accumulation of silt in reservoirs as well as in beds has further reduced the carrying capacity of rivers, besides increasing water velocity and intensifying bank erosion. Similarly, the development of canal and drainage infrastructure in lands has obstructed the natural drainage of streams and hill torrents that ultimately are discharged into the river basin. For instance, the development of canals branching out from Chashma, Taunsa, Guddu and Sukkur barrages, and the RBOD have seriously complicated the drainage of hill torrents on the right bank of the Indus in southern Khyber Pakhtunkhwa, south-western Punjab and western Sindh. Last year`s floods and the extraordinary torrential rain in Sindh in 2011 have revealed how the drainage crisis of the Indus basin has turned out to be a permanent flood hazard, exposing the people of the country — particularly those living in Sindh and south-western Punjab — to new risks and vulnerabilities. As mega irrigation and drainage projects involve enormous economic costs and technical expertise, international financial institutions (IFIs) have been at the centre of efforts to promote a techno-centric approach to water development in Pakistan. They have played a role not only in complicating the drainage crisis in the Indus basin but also in incurring a heavy foreign debt. The World Bank (WB) and Asian Development Bank (ADB) have prescribed, supported and funded many mega structures like the Tarbela Dam, Chashma Right Bank Irrigation Project, LBOD, NDP, Chotiari Dam, Taunsa Barrage, the Emergency Rehabilitation and Modernisation Project (TBERMP), etc that are socially unjust, politically exclusionary, economically exploitative and environmentally disastrous. It is high time to find a sustainable solution to the drainage crisis in the Indus basin, besides holding WB and ADB accountable for inflicting death, disease, hunger and livelihood disruptions on hundreds of thousands people affected by last year’s floods and this year`s heavy rains in Sindh. The IFIs must be pushed to compensate the people. The writer [Azhar Lashari] works for an international anti-poverty organisation.